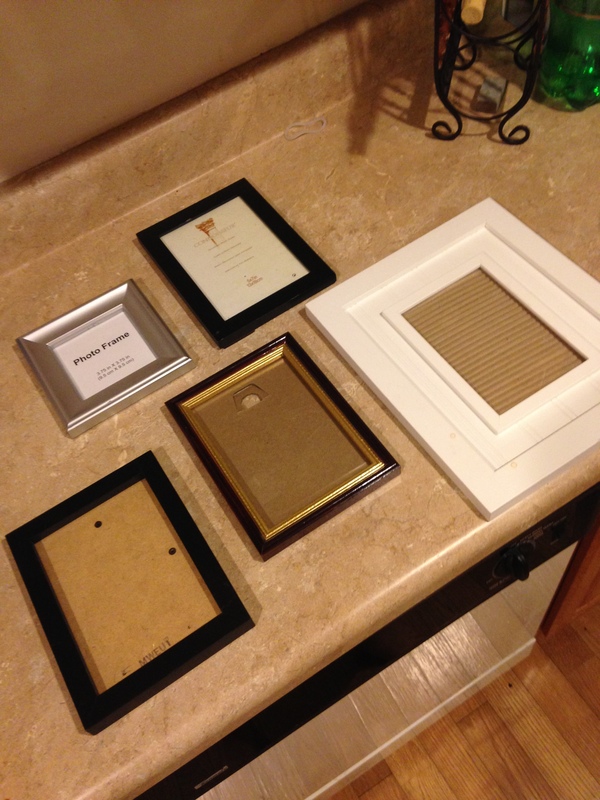 Five un-matching, but otherwise in good condition, frames from Goodwill. How can you beat that…. Enter handy can of gray spraypaint that I got at a yard sale for .25 last Spring, or for about $3 at your local dollar store. 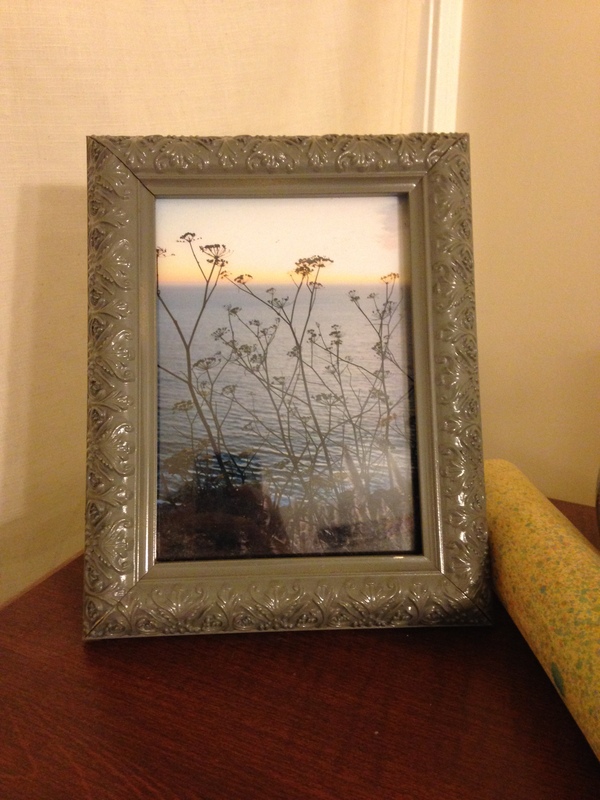 And voila- matching frame display for my wall. 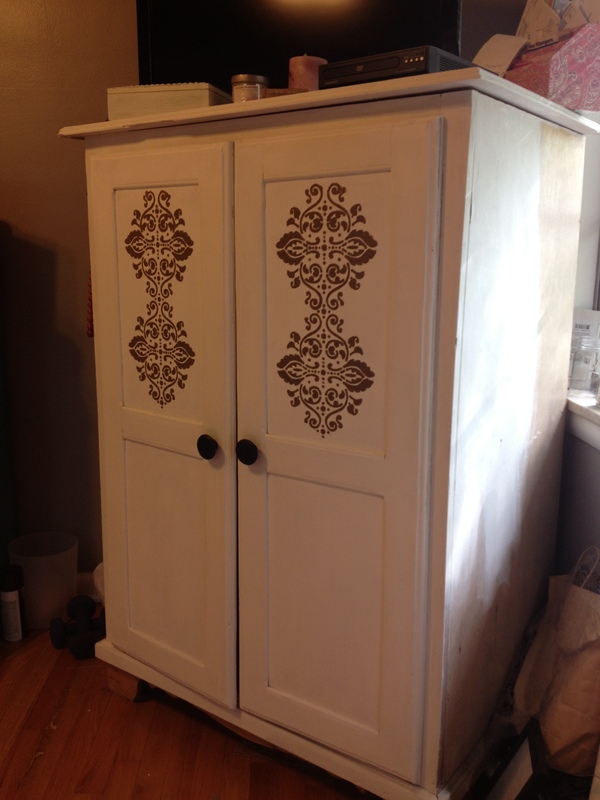 I couldn’t bring myself to spray the white one- it was just so pretty, and white goes with anything anyway…. The detail is so pretty, but the color- to me- was not so much. It was that gold that you find a lot at thrift stores that just isn’t so up to date looking any more. I love the way this turned out so much, that I went and found some more, which are all the ones displayed in the first few pictures. My “Feet on Streets” grouping. 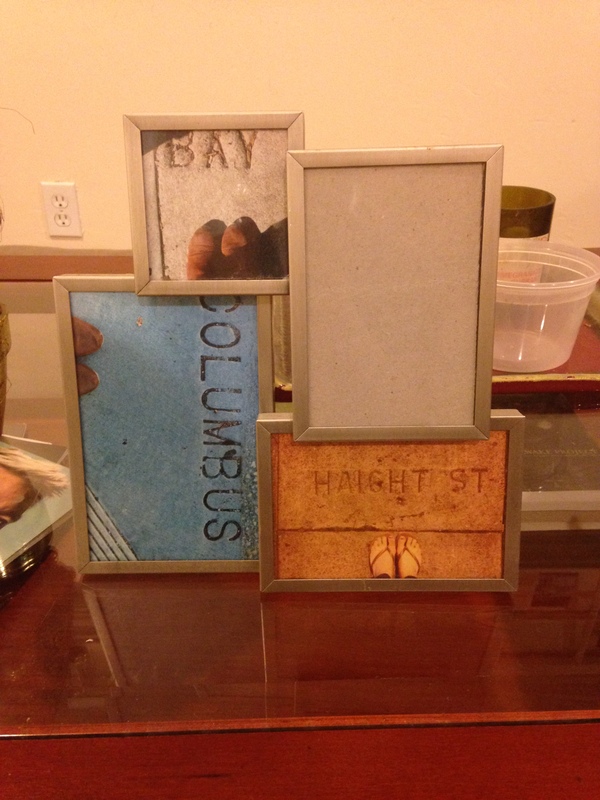 I’ve been searching for a set of four frame like this to put my fun pictures of my feet with the street names. In San Francisco, the street names are carved into the sidewalk all fun like this, and I fancied taking pictures of my feet whenever I found myself stopped at one. 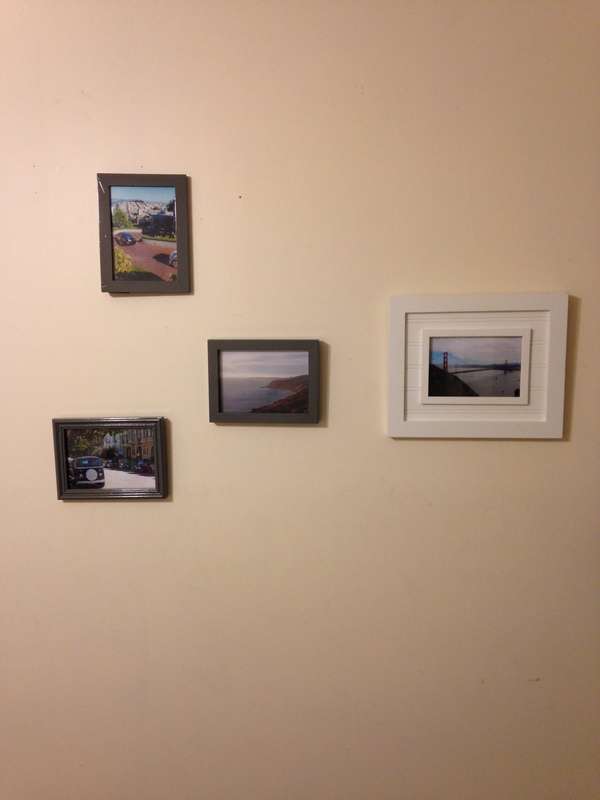 And I thought a framed grouping might be a nice memory of my walks around San Fran. I have several more to fill that last empty slot, I just need to get em printed! And lo and behold, a year later, for 1.50 at Goodwill, I found just the one. I couldn’t be more happy with how it turned out. And I immediately texted the girlfriend I made the trip with my results, and she happens to be in San Fran again right now visiting her sweet seester. Frames, frames, frames! So pictorally happy right now, thanks to Goodwill. Do you shop the home section at Goodwill too? Ok so this isn’t exactly reusing paper towels, but it still saves some money and looks cute. I don’t know how I stumbled upon this idea, or if I searched it out, but I indeed had two extra drawers hanging around I didn’t need, and guess what, it turns out they’re are bountiful ways to repurpose drawers (just check Pinterest!). 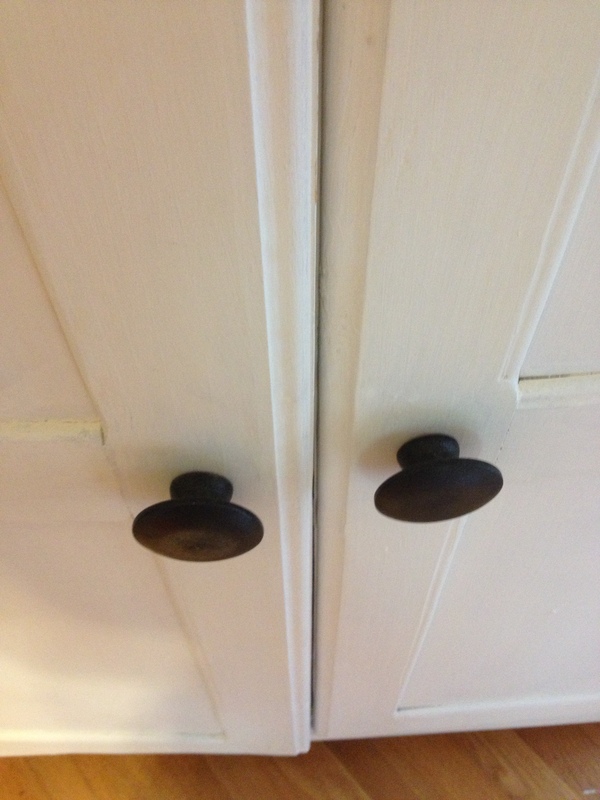 One of these ways being stacking them- after removing the knobs on the lower drawer of course (optional to remove them on the top) and turning them into a shelf. Voila. 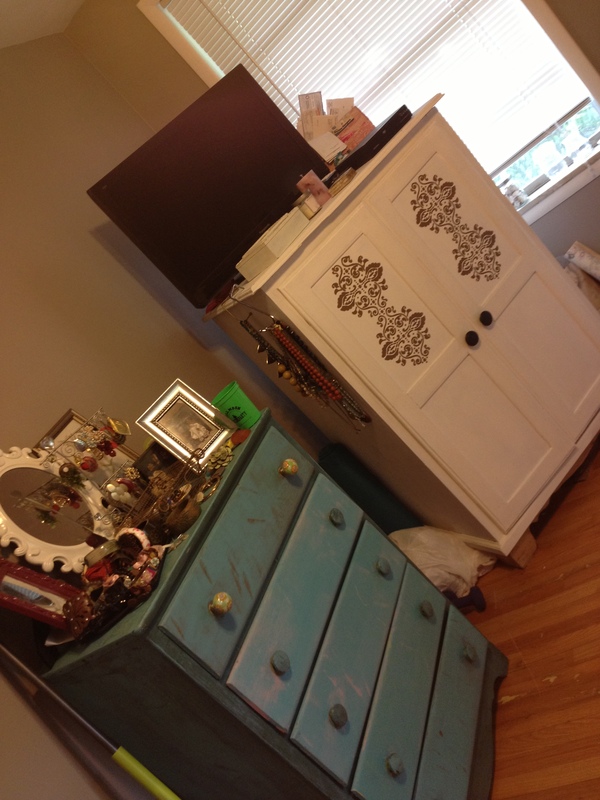 What was two old drawers, is now a useful, chic, repurposed, environmentally friendly book, picture and snack holder. K, you caught me. There was a snack on the top shelf where the cross stands in the picture. I took the snack out for the picture, trying to act proper and like I don’t snack I’m bed. It was chex mix if you must know. The generic kind. Does the trick still. I had one of the drawers hanging on my wall as a hanging shadow box type shelf, very cute, but I have since rearranged my room, for the fourth and hopefully last time since arriving in this abode, and this works better now than the shelf. And I hated to have the drawers separated like that. Right now I don’t have them attached with glue or anything, but it’s pretty secure just sitting pretty on top of each other like that. And Those Who Can’t DIY…Buy? 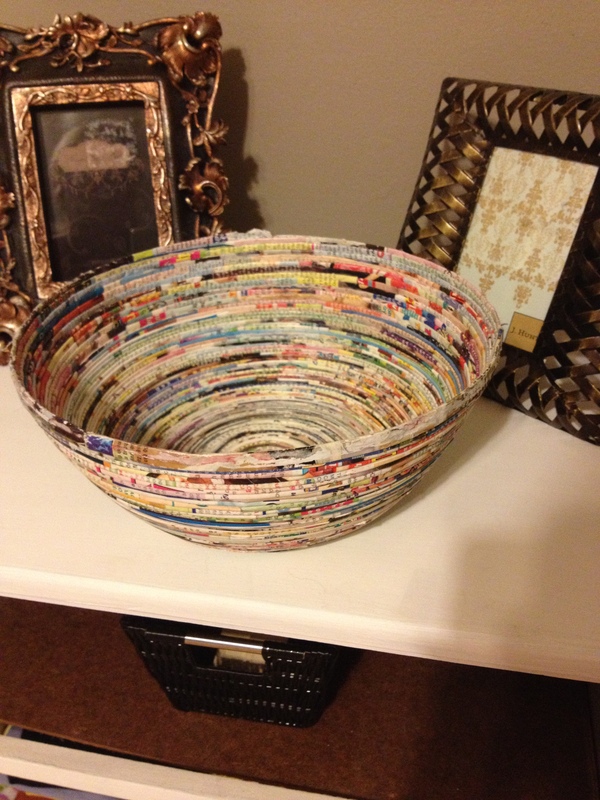 Rolled Magazine Paper Bowl DIY! Well, not normally in my case, but for .99 at Goodwill, yes. This was such a find for me. I mean, ya know I love a good craft, but I don’t always have the patience skills time. This looks pretty difficult actually. Either way, it’s fabulous and I can’t wait to display it in the new house I am moving into next month in my FAVORITE area of town. 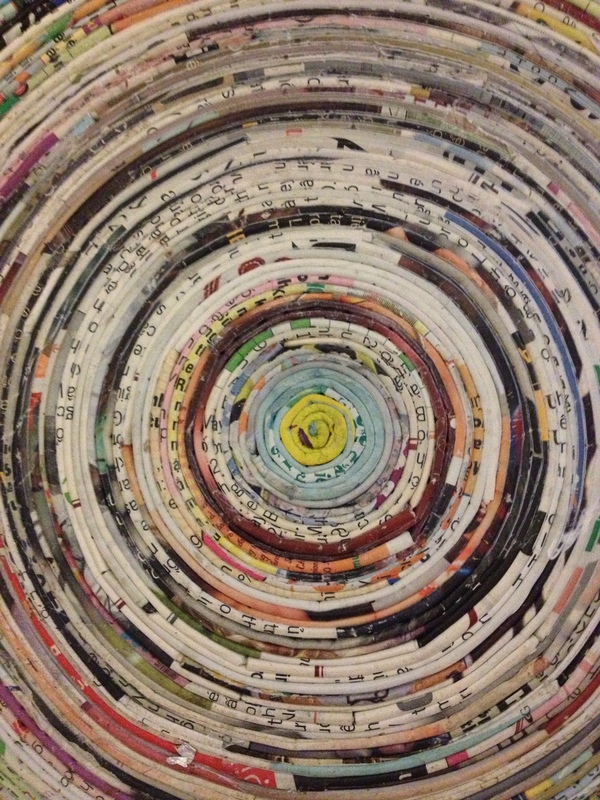 Since I didn’t actually make this one myself in order to show you how to, I found a lady who did, or at last has a link to how to do it. 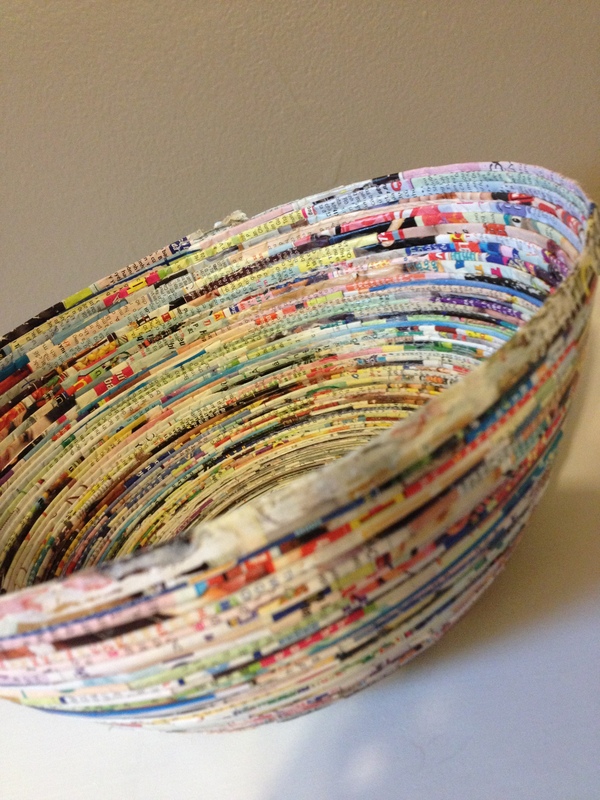 So here is my link to a link to create your own rolled up magazine paper basket, and it’s actually two slightly different more fun versions of it. 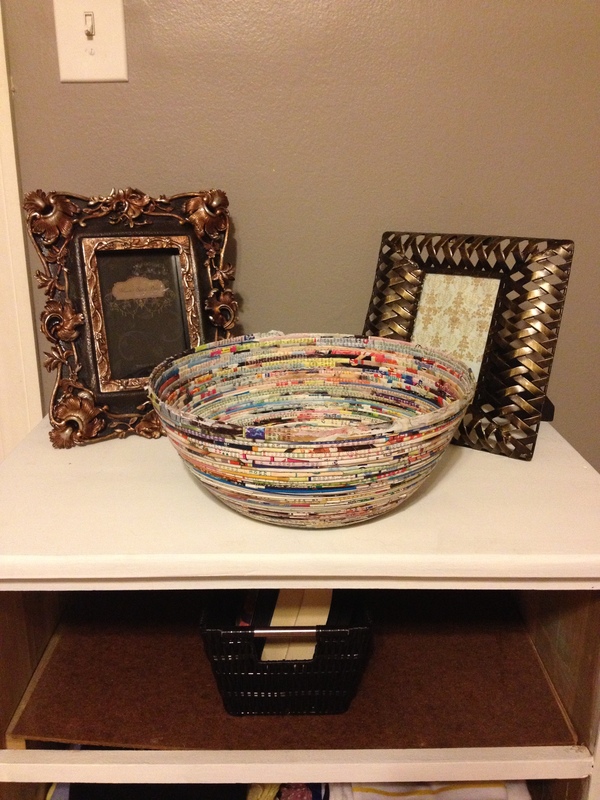 The blog is www.doitandhow.com, and this is the page with magazine paper projects, including two bowls and one frame. I’m telling you, if Pinterest was more like this blog, I would be addicted to it just like everyone else. I couldn’t stop looking at her posts once I found this one. Each craft and DIY was so cool! I want to do every one. One was making a necklace out of an old t-shirt by cutting it up and using the fabric. 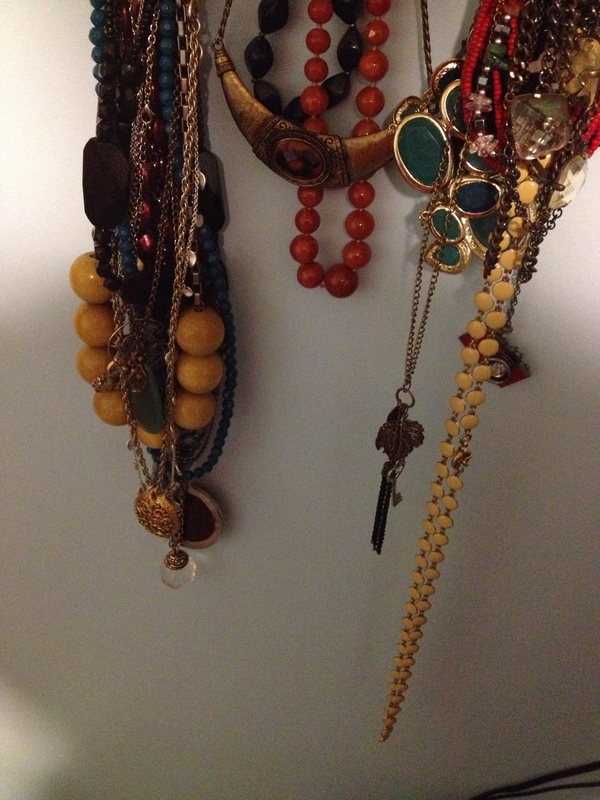 I like necklaces! I don’t like spending money! I can find plenty of old cheap t-shirts at Goodwill! …another was turning old mason jars into cool ones with words on them using a hot glue gun and spray paint. I have all of those supplies!!! And on my reactions went…. 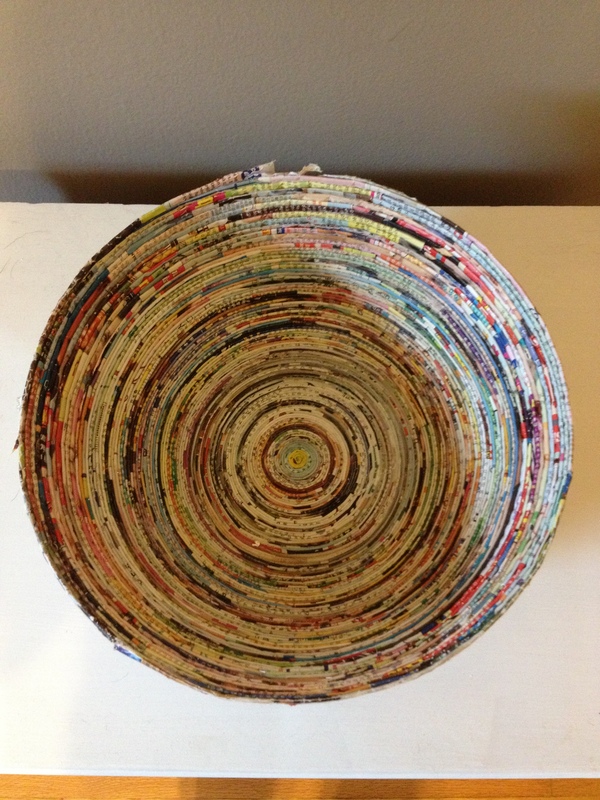 So you should check it out and find some cool projects, in addition to the DIY magazine paper bowl one. Let me know if any of you try it and are successful!! Looks like so much fun! And I have fixed up. The above bureau to be exact. I like it quite a bit. I started with the white paint. And then was at Michael’s getting supplies to make something for my new niece Summer Jane, and saw the stencil I used above and knew I had to get it. 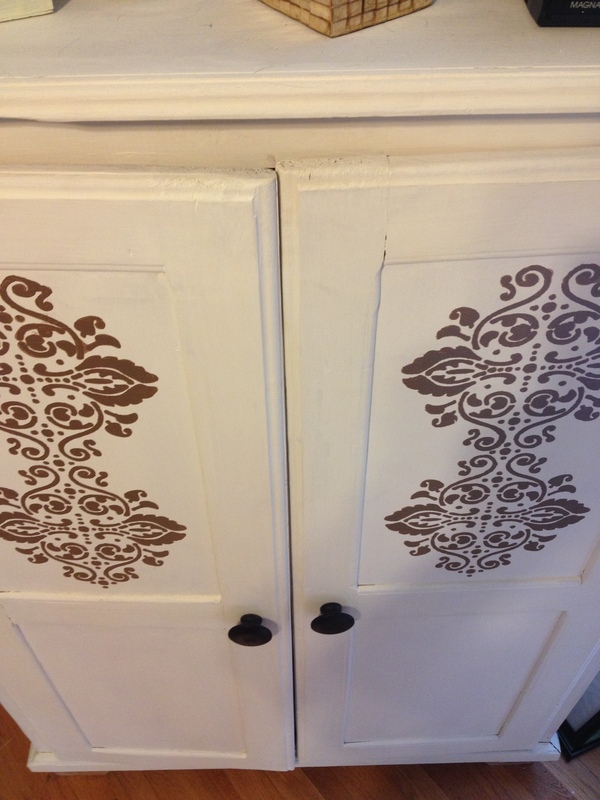 The example the stencil packaging had on it was of a bureau just like mine, same exact doors and everything, so I can’t take too much credit for seeing the stencil and thinking of my bureau. It was pretty much laid out for me by Martha. I then tossed the idea up of either doing one in the center of each panel door, or two on each, like I have above, kinda. I went with doing two, and then decided that was ‘two’ much 🙂 and did not do any on the bottom panels. I think it works. 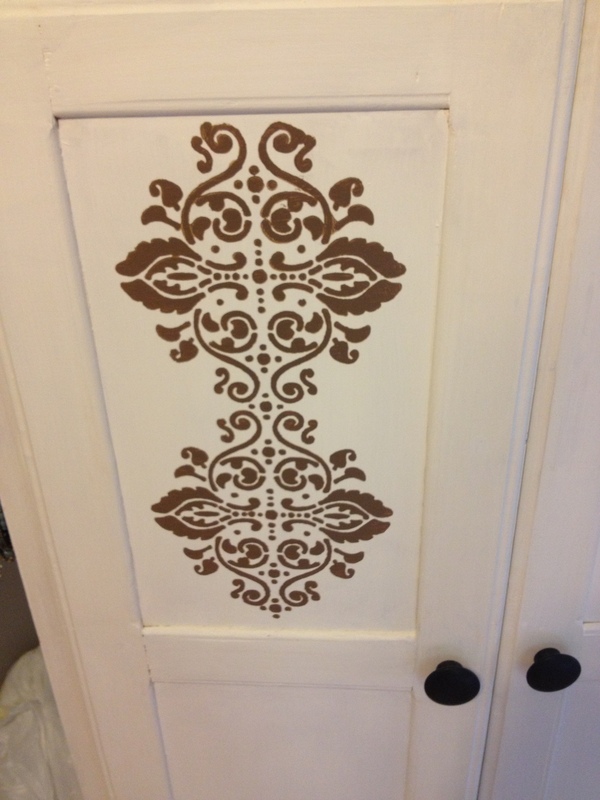 I’m in love with the stencil. Adds just the right amount of elegance and whimsy. And competely recreates the bureau. I had wanted to do a nice refinishing of the wood, but that was much more work! Apparently. My friend said the wood on top was not a quality wood like the doors to be refinished and would be very difficult. And I had paint on hand, and then a stencil appeared in my life, so this is what happened. 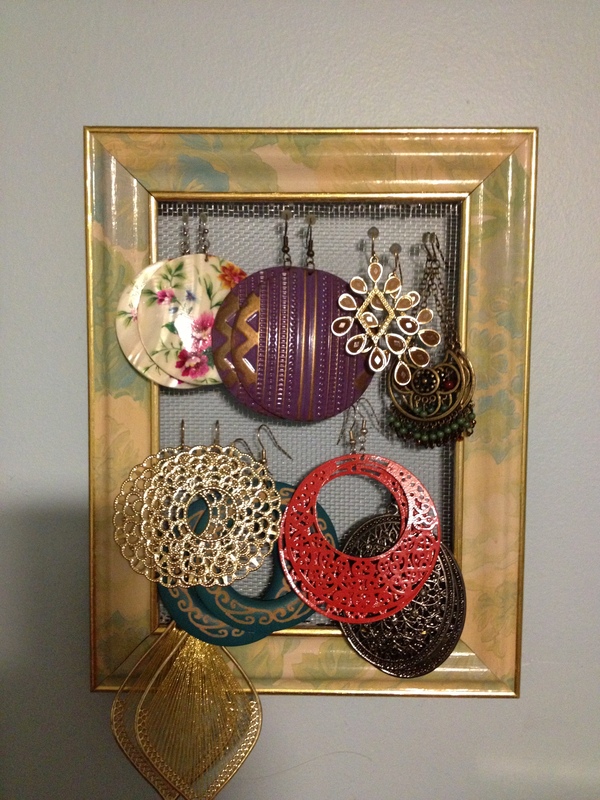 First DIY (that I’m sharing)- Picture Frame Earring Holders And….First Giveaway!!!! 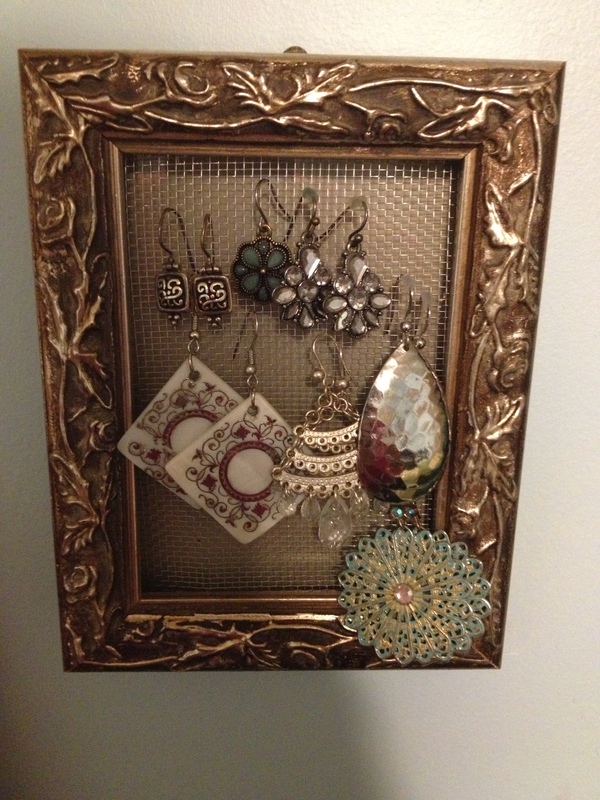 I have found the secret to making earring organizers/holders/hangers by yourself, out of old (but still awesome) picture frames, wire mesh and super glue, and that’s it. And I am going to share it with you. You’re welcome. And trust me, if I can do it, y’all can. I am common sense challenged in this life, and the littlest hiccup in a project will send me reeling and having no idea what to do. I have succesfully made three of these and they have been functional on my wall for going on four months now. I would say that means I did it right. And I will do my best to explain it to you. 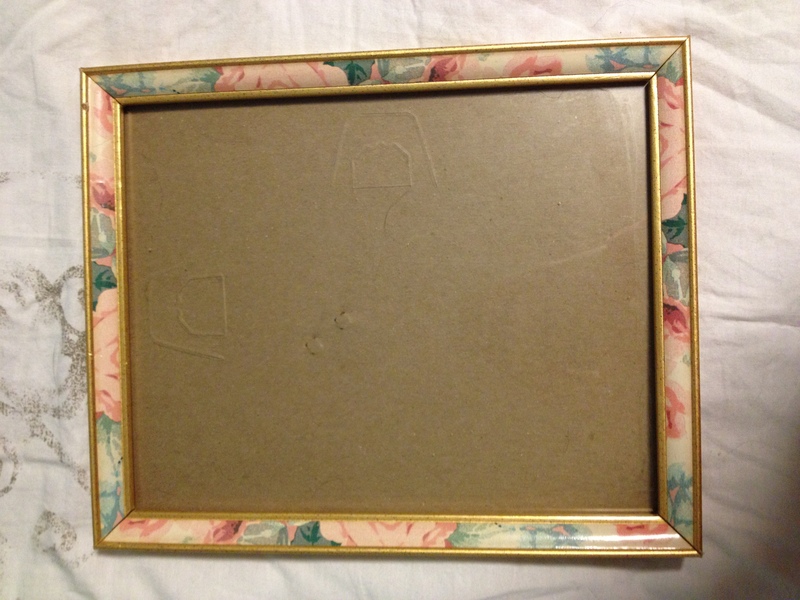 Obviously, you’re going to start with your local Goodwill (or another just as awesome thrift shop) for some old picture frames of your choosing, suiting whatever your individual taste is. Did you think I wouldn’t give close ups? They go from smaller to larger left to right, although it is probably hard to tell. They are 3×5, 4×6, and 8×10. 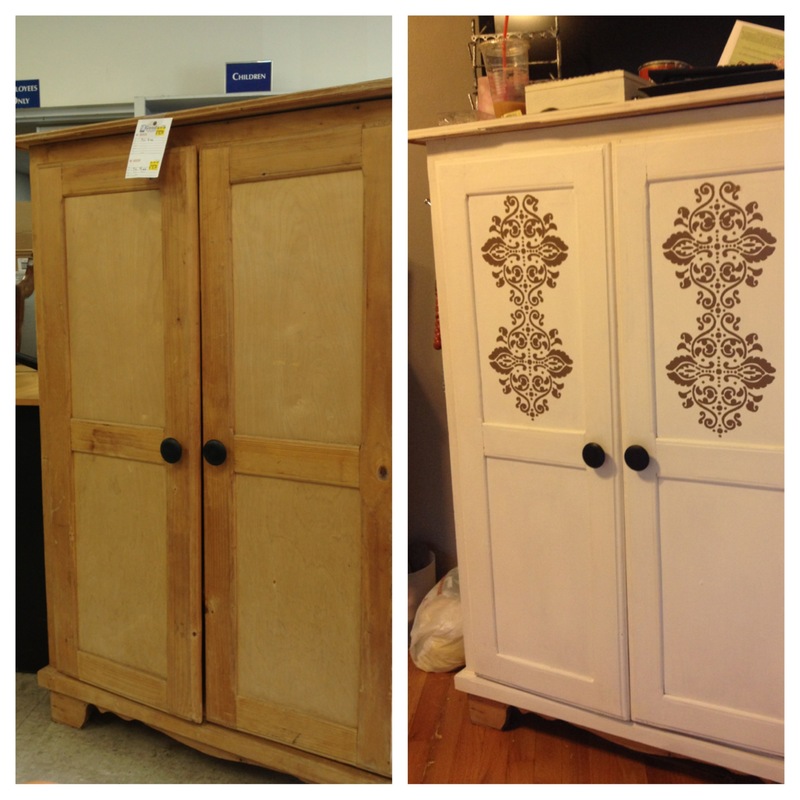 The one on the left stands as well, but I choose to hang it cause I don’t have the largest dresser top. 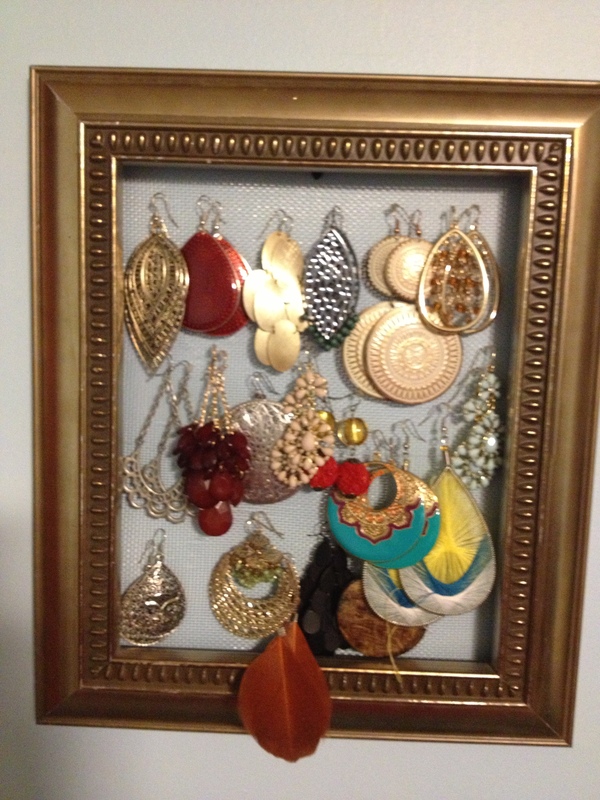 And thank you, I know, I have an earring problem. I love jewelry. I’m a girl. Duh. So that is the great thing- there are so many different style frames out there to choose from, that it completely changes the style and look of each item without having to do any additional work except picking it up off of the shelf. Pretty easy if you ask me. You will see the three that I have are all different but each one great in itself. But depending on your style, you could go industrial looking, plain wood, colorful, vintage…the options are really endless. 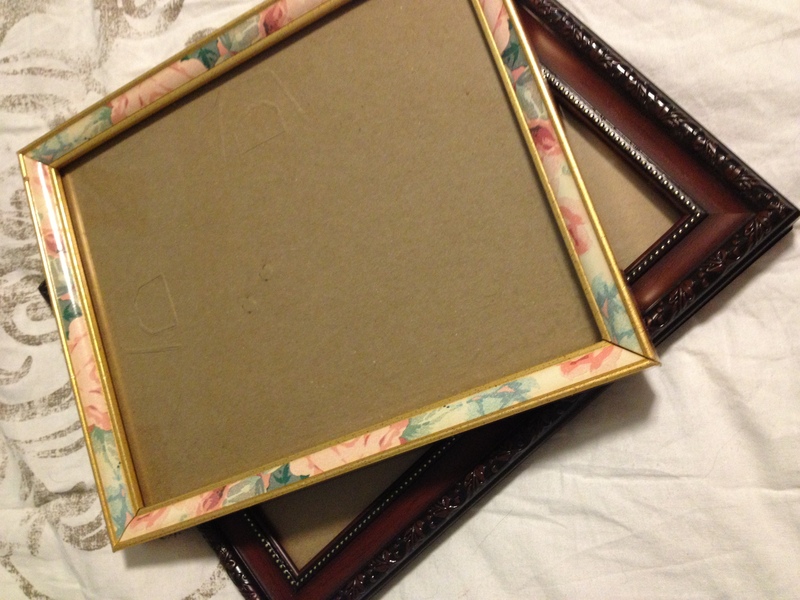 So the first step is done, you have found your awesome beautiful frames that will look great hanging or standing somewhere in your I’m sure lovely bedroom (or closet for those really lucky ladies), now you need to buy wire mesh for the hanging part. I bought literally window screening at my local hardware store, the smallest amount they sold. I’m not a factory… They had two options, matte or shiny. I chose the shiny. Matte silver tends to just look dirty, and no one wants their earrings hanging on something that looks like its covered in dirt. 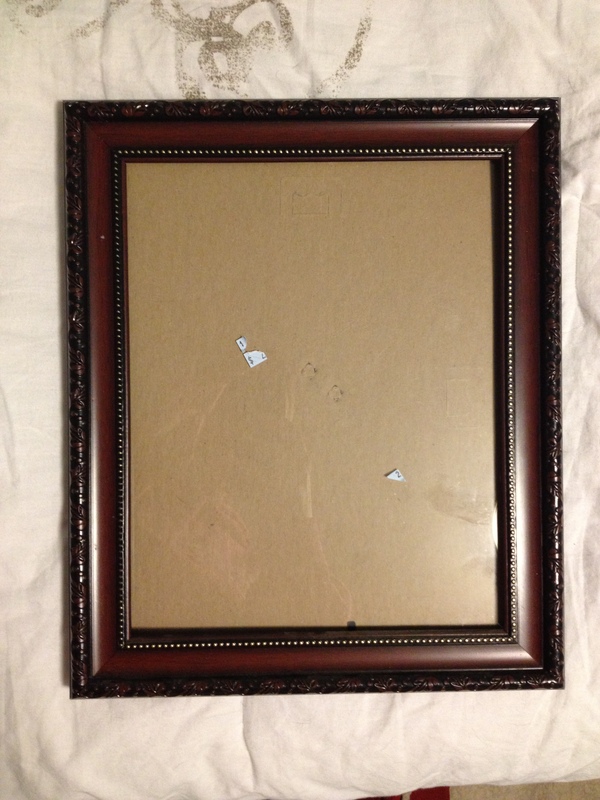 Choose said frame that you would like to start with, take out everything from the frame- glass, cardboard,etc, all you need is the outer frame piece, and place the wire mesh over the back and cut out a piece big enough to fit. Pretty basic. I think we all started doing similar things in Kindergarten/first grade. 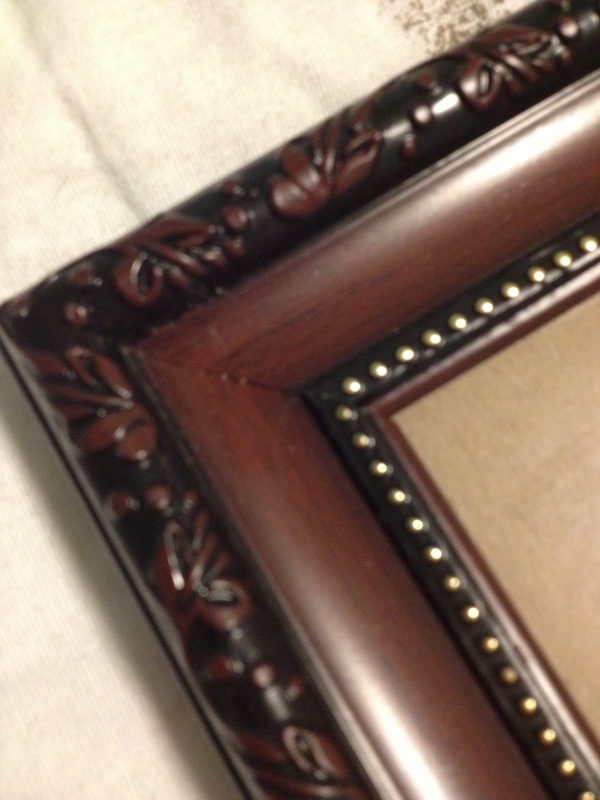 THEN, you take the hot glue gun and put glue around the edge (on the back of the frame where you can’t see), and then press the wire mesh down into the hot glue. I used my fingertips to press, you have to do this because the wire mesh doesn’t grab to the glue easily because it is so holy. Then, voila! You wait for it to dry and then you hang your earrings on it. 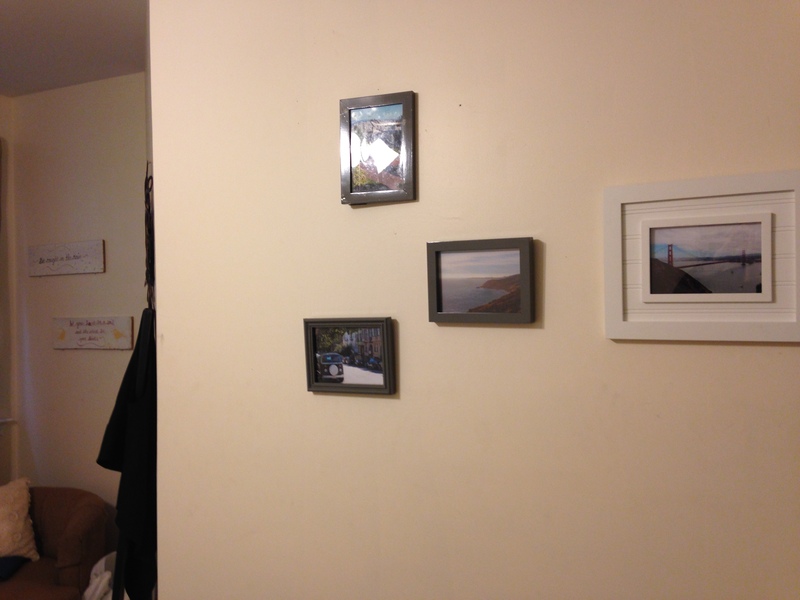 And I hung them on the wall with thumb tacks. Pretty simple. If you want to stand the frame up, then you can put the back back in that will make it stand, otherwise, no backing is necessary and this leaves more room for the hooks to go in. 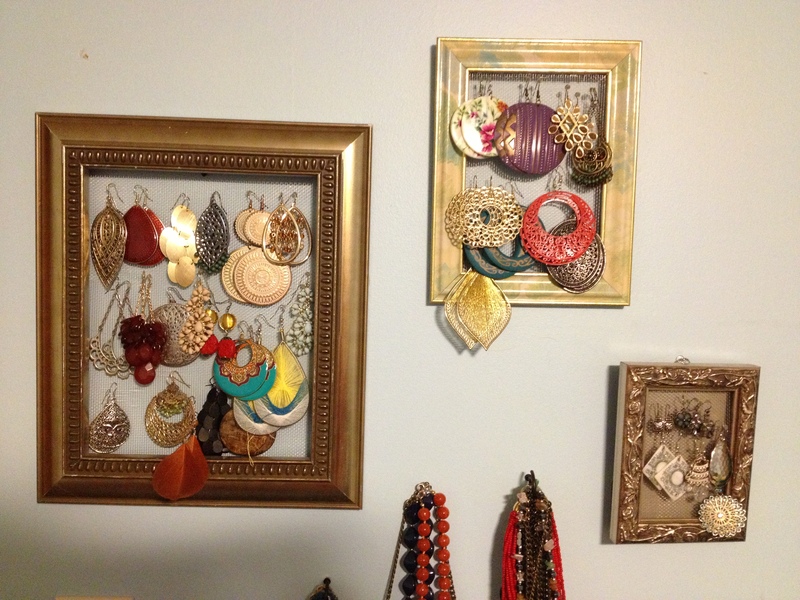 If something can’t hang on my wall with thumb tacks, I don’t buy it. Period. I hope this is informative, I didn’t have a ton of pictures for each step, I apologize. I did them like four months ago:) Just thought I’d share what I could! But the giveaway can’t start yet, these are actualy currently for sale on ebay, so I wouldn’t want to promise one and then have them all sell. I will notify you on my next post if they are/which ones are still available for the giveaway, and then start it. Keep your eyes peeled! You’ll need to comment on this post. That’s it. I’m not much for rules. I will randomly generate a number, and the commenter who was that number will win! Pretty easy, and then if you don’t win, you can still follow my blog and get awesome thrift store finds and stories a couple times a week in your e-mail! And hopefully have some entertainment along the way:) A win-win really. Lastly, on a totally separate subject, I have been getting compliments like woah on my latest green purse purchase for $8 (obviously from Goodwill). It seems like everywhere I go someone tells me how much they love it. It just proves, you can shop cheap, help out a good cause, and look good doing it! And people will never know the difference. It’s a great world. A ‘good’ world if you will:) And I will. Peace and love and happy thrifting!